Yesterday I rolled no-gi for the first time in a while. No-gi classes are on the weekend; time my wife, Tania, and I take care of home and baby stuff, so I usually do not get to attend these classes. But yesterday I made it to no-gi class by making a strategic time trade with Tania. Matrimonial grappling! Being on unfamiliar ground; rolling without the benefit of grabbing onto an opponent's gi, I found the no-gi situation initially frustrating. The moves and fundamentals were the same as gi training, but more difficult and less forgiving when going on the offense. And a little easier on defense accept for dealing with the high skill level of some of my teammates. That brings me to some thoughts from this class; in any situation you either "react" or "respond". When I am put in a new, unfamiliar, or position or situation I have trouble dealing with; I react. My reaction comes from an unconscious awareness of a situation that must be dealt with quickly. 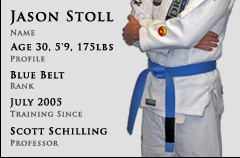 Untrained reactions, like mine as a white belt, are usually clumsy and defensive. Or sometimes my reaction could be, "hey, look at what I got" and then leads to a successful offensive movement. But reactions are simply unplanned. Responses are far better than reactions when learning. A response implies an awareness to a situation before it happens and as it is happening. Responses are a result of repetition of training a specific move over and over until it can be understood and applied properly when the situation allows. A response means you know what is going on from start to finish. As a white belt, most of my rolling is reaction based and the reactions are most times incorrect. But every once and a while, thanks to my training and repetition, I get to respond. Setting up and being aware of properly applying an Upa from the bottom of a mount, triangle from a broken closed guard, and various sweeps are currently my automatic "responses" to situations. I add more and more responses every time I train and every roll I fight.